Take 12,000mg of Collagen everyday, and you find yourself looking forward to looking your face in the mirror every minute. Featuring 4 ultimate beauty ingredients; Collagen Peptide, Chondroitin, Hyaluronic Acid, and Elastin. 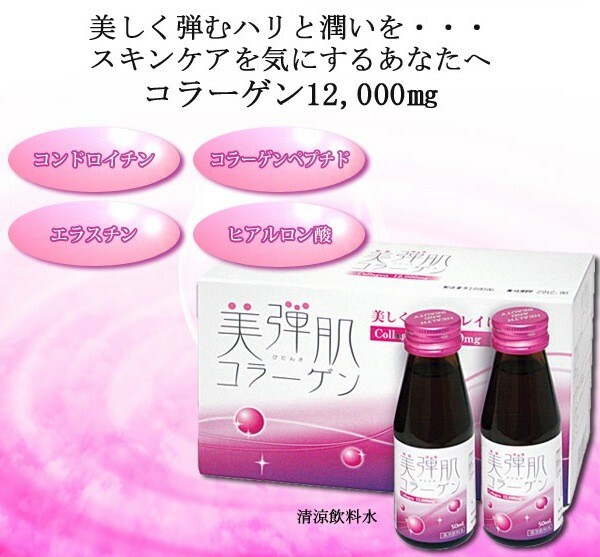 > Collagen Peptide (fish-based): Collagen is indispensable protein for building a body, and one third of its protein in the body is made from Collagen, and therefore, Bidanki quickly and smoothly supplement its collagen balance. > For those who are concerned with the lack of moisture and elasticity of the skin, and when the makeup does not really fit on the skin. > By taking one bottle a day, beauty-ingredients are quickly and effectively "absorbed" in the body for them to blossom to the real beauty.